Nearing the twins birthday has me thinking about their next Individualized Education Plan meetings. Throughout life, my children have faced developmental challenges in addition to their medical ones. 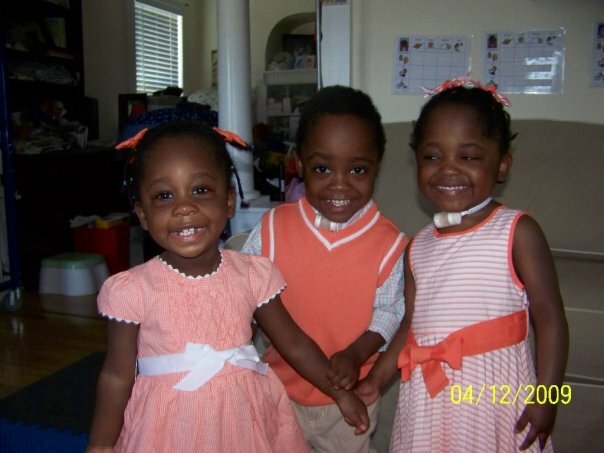 My children have several diagnoses of developmental significance, including Cerebral Palsy (CP), in addition to their medical ones of “Chronic Lung Disease of Prematurity” and “Gastro-esophogeal Reflux Disease” (GERD). From an early age, right after discharge from the hospital, my children have participated in several therapies to help them to ameliorate these challenges. Beginning far behind the 8-ball as 27 weekers at 1 pound-12 ounces and 2 pounds-2 ounces, my kids have come a long way to the thriving, speaking, growing preschoolers they are now. When they arrived at MY home at 14 months, Tav still played almost exclusively with his hands and lay on his back unless propped or held in another position. Adrien had yet to walk but was cruising along furniture and sat to play by banging or stacking toys. Shortly after moving in, Adrien began to walk and Tavi began to reach for and grasp toys. The months of Early Intervention in their foster home and its continuation here had begun to pay off. After their first airway reconstruction surgery, to correct the severe narrowing under their vocal cords, the Early Intervention team expanded to include Speech Therapy and Physical Therapy in addition to Occupational Therapy. These therapists saw my children through many milestones, from becoming independent in sitting to standing to walking to jumping in physical development, from learning to voice sounds to babbling to vocal words in language development. Although my kids made wonderful progress in Early Intervention from birth until the age of 3 years, they continued to need services when they turned 3 to support continued growth and development in these and other skills. The school district met with me and the Early Intervention team and agreed, in the case of my children, that they would best be served by continuing in-home services to avoid exposure to colds and other illnesses that could be life-threatening to them. Wonderfully enough, the Early Intervention team that had been working with them included members that could contract with the district to continue to provide services for my children. These people, PT, OT & SLP, brought a skilled team to our home to work with my children on moving forward. For the first year both children received OT & Speech services, and the PT came to work on strength, motor planning and muscle control with my son. This past year, my daughter continued with only speech services from the SLP, needing to work primarily on voice quality, rather than vocabulary and language development. As we hit the mark for their third IEP meeting, I view my children’s progress as reason for celebration. My daughter may no longer qualify for services of any kind, although she continues to have a soft voice and may need more work on breath control when and if she has her trach removed some years off in the future. My son now walks, runs, draws simple people, uses scissors to snip paper and speaks in complete sentences when he is calm and comfortable with the person he’s talking to. He still struggles with strength and endurance (common across all 3 of my younger children), grasping crayons and using enough force to make clear marks on paper, eating textures or solid food and communicating clearly. Both children continue to have health needs that limit their access to participating in groups of children, so neither will be enrolled in a preschool class. It is wonderful to have 3 preschoolers in the same home so we can do group activities and they can learn the give-and-take of sharing and playing with others. During the upcoming IEP meetings, I will work with the team to design an educational plan which will help both of my 5 year olds to continue to grow and flourish. Will it be one plan? Will there be two? That’s the great thing about working together with a team; different opinions and impressions will be considered and we will hopefully agree to the plans necessary to help my children continue to move forward in their development. Family is about sharing traditions. Parents bring traditions with them from their childhood home, like Christmas stockings, when Santa arrives & the way birthdays are celebrated. As families change, become larger, spend more time in their own nucleus, traditions uniquely their own develop from day-to-day activities or new needs of their nuclear family members. When I was a parent “the first time”, traditions included Christmas stockings, an empty tree base until Santa came overnight, celebrations of Hanukkah & Shabbat – singing Hebrew blessings at candle light and enjoying dinner & playtime with only these candles to brighten our winter evenings. Saturday morning breakfast out at a local diner- even as we moved across the country and back- and batting cages, Little League, Cub Scouts… riding bikes together. Sometimes we read Harry Potter in the evenings, sitting together on the couch and taking turns reading the paragraphs or pages to each other. My oldest and I share a love of literature and adventure stories which includes sharing books back and forth over MANY of the last 12 years he has been a reader. When the twins arrived, with oxygen tanks and open airways to their lungs, traditions changed to more home-based activities- with fewer open flames! We have the occasional Shabbat inspired dinner, but with nursing on Friday and so many feeding issues, well, one could see how that might no longer apply as a time to celebrate. We have changed family traditions as the grouping of people changes, or as we get interesting hand-me-downs! Even before use of their upper airway for sound, our house has followed the score of what I call “My Life as a Musical”. We have wake-up songs I sing to the kids, songs for washing hands, name songs unique to each kid in the house, songs we sing to comfort or rev up, the complete score of the “Wizard of Oz” musical my sister was in as a child, selections from other musicals. My favorites are our bedtime songs including “It’s the most wonderful time of the day” and the “Love you Forever” song I sing each and every night to each kid individually- right before they sing it back to me. Without our good night musical transitions, my kids are restless, sometimes agitated, and may stay awake hours trying to settle in. Even when I go to the hospital for an overnight with one, I have to call home and, regardless of audience (e.g., docs, nurses), sing to the other(s) who are readying for bed there. All scheduled nebs are done together as a group, twins in cribs, youngest sitting upright across from them. I dress the twins in similar colors, and include Youngest in the grouping with either a similar “style” (e.g., her signature green Hanna dress when they wear blue & yellow), or in a similar color pallet when we go out. It’s a trick used by other families to keep track of their kids in public places, I think it emphasizes the twins identity as such, without making them look completely the same, and differentiates my youngest as “belonging” but not being one of the “twin unit”- altho, believe me, “are they triplets?” is as popular as the ever inappropriate “where did they come from/ you get them?”. Anyway, sometimes similar colors come from my choosing the outfits in the same mood, just like when you go to your own closet! The more unusual of our traditions is the one we celebrate many Fridays. A couple years ago, the kids got “Hand-me-down” clothing from their biological older sisters and cousins. Their biological family are “dress up for church” people and the girls inherited these GORGEOUS tulle and velvet or embroidered dresses that are MUCH too fancy for anything we could ever dream of doing as a family in our quest to avoid germ exposure and stay healthy! SO, in order to give my girls access to these beautiful dresses and use the hand-me-downs so lovingly cared for before we got them, we began using Friday as a “reason” to dress up. We call these days “Fancy Friday” and the girls wear extravagant-looking dresses with tights while Trachboy dons dressier button-downs and sometimes white pants. We go through our day as we would otherwise- heading to doc appts., running errands, riding bikes along the Riverwalk, playing on the deck or slide, or staying in and hunkering down if there’s not reason to go out and the weather is not agreeable to outdoor play. It is one of the more unique traditions that gets lots of comments and raised eyebrows- pink tulle tiers below a black velvet bodice are a bit dressy for an airway appt… The kids love it. It’s quirky and something that defines our family unit as uniquely US. What are traditions unique to your family?